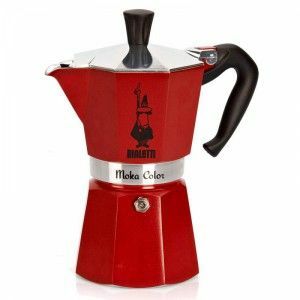 Bialetti stove top coffee pot red. 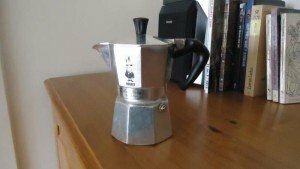 This Bialetti Espresso Maker review is about a stove top coffee pot which is perhaps not so typical camping tool. But in fact, it is more than that, suitable both for home and outdoor use, and for travel as well. This is also an ideal choice as a gift to somebody who drinks coffee. Here, I describe the pot and how I first discovered it somewhere in the Italian Alps. So for me, everything related to the Bialetti coffee pot is very much connected with mountains, although I use it at home as well. It is simply always with me, regardless where I go. My first encounter with the Bialetti stove top coffee pot was in rather unusual circumstances. 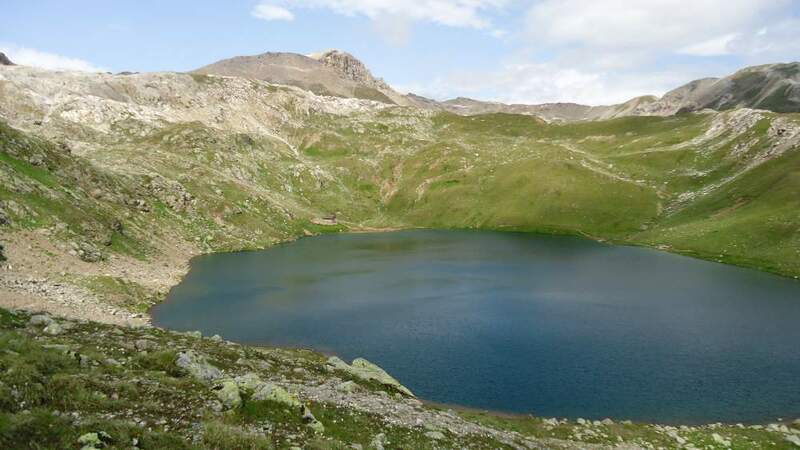 Four of us were climbing Monte Breva (Piz la Stretta) mountain in Livigno area in Italy, and due to rain we were forced to find shelter for a few hours in a refuge at Lago del Monte (2606 m), see the picture below. This is an object without a guardian, always open, and equipped with cooking stuff including both a gas and a wood stove. The ambient is simply breathtaking, just see the picture below. Click to enlarge and to see the refuge. Refuge at the lake (at 2606 meters above the sea) on Monte Breva. My first encounter with a Bialetti stove top coffee pot. There was a strange object there, in fact, two of them, see the picture here on the right, this is the actual photo from the mountain refuge. One of my friends, who was from Japan, explained that this was an Italian stove top coffee pot, well-known and popular even in Japan. Surprisingly, coffee was available and we prepared it using the pot. I was so delighted with it that later in Livigno my friend decided to buy me one as a present. So here below is this same Italian coffee pot which I received as a present that day in Livigno. My own Bialetti coffee pot – silver color. Should I add that after this episode this is my only tool for making a coffee. Indeed you can use it anywhere, even if you go camping, or travel on vacations. It will work fine regardless if you use it on a hot plate in the kitchen or with a gas burner in your outdoor camp. 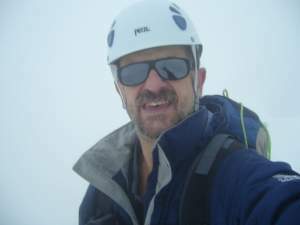 You can see my Bialetti here used under the summit of Razor in the Slovenian Alps. I have not used it to prepare coffee on an open fire, making an open fire in the Alps is mostly prohibited, but I guess it would still work. Though there is a bakelite handle (see more below) which might be affected by the fire. 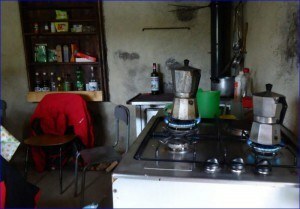 With a gas stove, it works just fine, see the photo above from the mountain refuge. Now back from my sentimental part of the story to the facts. Being intrigued with the pot, I did some research on this subject and here is what I have found. Bialetti family started their business about 80 years ago. According to Wikipedia, Bialetti (1888–1970) was an engineer. He acquired the original invention by Luigi De Ponti, and that is how Moka coffee pot appeared first. The pot is made of solid aluminum and with a bakelite handle. As a proud Belgian citizen I cannot resist and wish to add that bakelite is a sort of plastic, i.e., more precisely poly-oxy-benzyl-methylene-glycolan-hydride, invented in New York in 1907 by a Belgian-born chemist Baekeland. But let us go back to Bialetti; they have produced a large number of things including several models of stove top coffee pots. Bialetti coffee post are used throughout the world, in Italy almost every house has at least one, in fact usually several of different size. This is a truly global tool. The pot has a safety valve, so you do not have to worry about pressure built in the heated vessel. 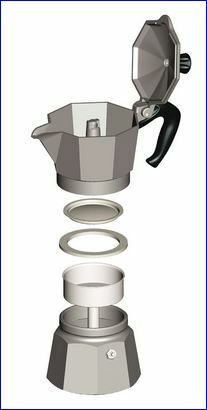 Principle of Bialetti coffee maker, from Wikipedia, by Alborzagros. Steel pot (Musa, Venus, Kitty, Laroma, Ilsa types). The principle of making coffee in all of them is similar. Water is heated in the lower container and forced by its own steam up, through the metal filter and through the coffee powder into the upper container. It is ready in just a few minutes. 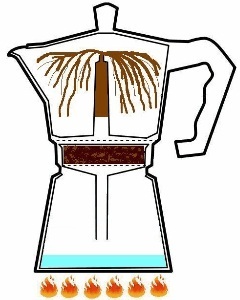 This design has been used from the beginning in the Moka pot. Over 200 million pots of this type have been produced since 1933. In a way it reminds me about violin-making evolution; after Stradivarius and his contemporary masters, the violin evolution has stopped. It simply achieved perfection. Note that the term “cup” should be understood in Italian way; they use very small cups. My own Moka shown above is for 3 cups, but I am using it for my 1 cup of coffee. Lover water container – heating vessel. Coffee powder container – funnel. Upper container for coffee, with the lid and the bakelite handle. Security valve on the bottom container. Knob on the lid (see the pictures). Hand wash. This is only to avoid eventual collection of chemicals in the valve. 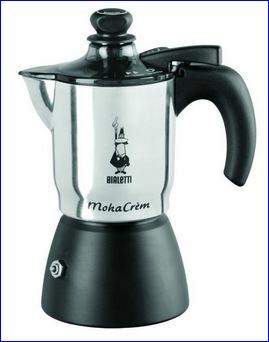 Basic data about Moka pots. Brikka pot includes a special dual-valve in its design, which allows for higher pressure in the lower container. This produces a large amount of froth and foam. This pot is produced in two sizes, 100 and 200 ml. The price is around $45 and $55 for the two sizes, respectively. For updates please check at Amazon. This pot contains a special frother through which air is infused into the coffee, resulting in an exceptional foam-like froth. It is made in one size, 3 cups (200 ml, 6 oz). The price is around $50 at Amazon. 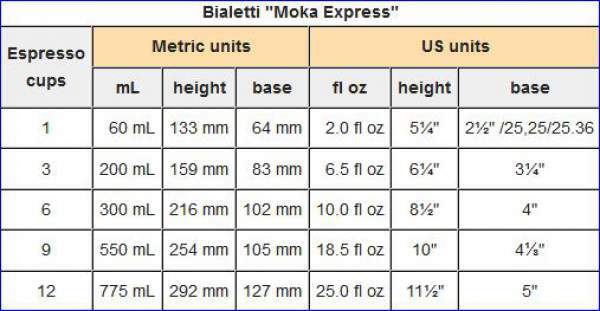 Regarding the Moka pot, you will see that it sometimes called Bialetti Moka Express and sometimes the word ‘espresso’ is used. But strictly speaking this is not the well-known Italian espresso, which is a kind of coffee machine. There is a difference in the pressure built in the container here, and in the espresso machines. In the Moka pot this is a naturally built pressure due to steam from the water, there is no pressure pump, it is just a pot. So the pressure raises up to around 1.5 bar (around 1.5 atmospheric pressure). In a typical espresso machine this is around 9 bar, while the temperature is most likely lower. For all Bialetti pots: hand-wash by water only. From my own experience, the best result and taste is if you use Lavazza Italian coffee, which is no surprise as, in my view, nobody makes better coffee than Italians. In general, the coffee should not be too fine ground. I tried a few times some particularly fine ground Greek and Turkish coffee and realized it was not the best choice because of the metal filter in the pot. I guess that too fine powder may result in the increased pressure in the heating vessel. With Lavazza, you will enjoy the best coffee you can imagine. The metal filter should be changed from time to time (say once a year), and it could be ordered from Amazon. But frankly, I do not see any reason for that because this is just a flat aluminum piece with tiny holes, which shows no signs of damage or any change in time. The same is with the rubber gasket, I change it as prescribed. In time, it becomes dark from coffee and due to the high temperature, which is normal, but no other changes whatsoever. So this piece is very durable as well. The bakelite handle is very strong, but in the case of damage, it can also be ordered and replaced easily. My own pot’s handle shows no signs of damage after a couple of years. Some people add preheated water into the container. Reason: to reduce the time of heating and to avoid that the coffee powder above is cooked. Apparently, this powder cooking produces more bitter taste. I do not do this. Reason: when you add hot water, the vessel becomes hot instantly and you cannot keep it in the hand, and you have to do so in order to attach it to the rest of the pot. Heating the water at low power (or with a medium gas burner flame) apparently reduces the mentioned effect of cooking the coffee powder which (as some claim) yields the bitter taste. I do not see any difference and normally do not do this. 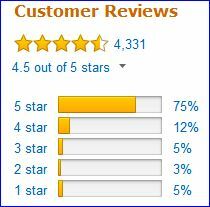 Rating of Bialetti Moka pot by Amazon users. This time I do not give cons because I did not find any. I am a user myself and I love this pot. In the picture on the right, you will see how Amazon customers rate this tool. Observe the huge number of reviews. This tells you how popular this coffee maker is. You can see some reviews with 1 or 2 stars. After reading some of them I realize that a number of them write about products that most likely are not original Bialetti. Always make sure that the pot has the Bialetti logo on it. You can see in all pictures above. I have been using this pot for a couple of years now, and I know well how great it truly is. To conclude this Bialetti Espresso Maker review with just a few words. This is an evergreen product and it has remained so in the past 80 years. Simple to use, this pot is designed to last forever, you will pass it from generation to generation. You will carry it in the luggage when you travel somewhere or when you go for camping. It is perfect for any situation and for any environment. What better gift for somebody who enjoys coffee. You remember that I received my Moka pot as a present. Well, the friend who gave it to me retired recently, so he was exchanging presents with people who gave him something on the occasion. This is a habit in Japan. So he sent Bialetti coffee pots as his gift to several of them. They were delighted and one replied it would be cherished as a family treasure. It should be indeed. 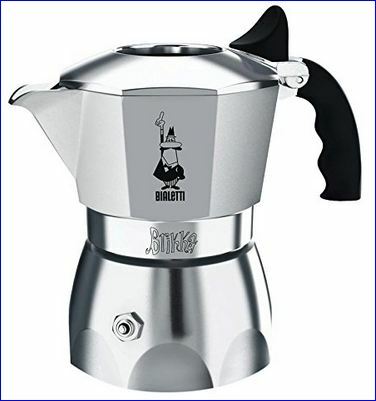 I hope you enjoyed reading the text and watching the video about this Bialetti coffee maker, at least as much as I did while searching about this topics and while writing the text. Please do share this text in your social media, there are some icons available below. Check the links (some images above are clickable) for the latest prices of these items. Amazon usually has the best price, and you may have a free shipping. It will be great to have your comments in the comment box below. Thank you. Have a most pleasant day! Hi Jovo, I just found your site (congratulations, really useful) and read this page. I am an italian outdoors lover and I always carry with me my Bialetti (usually 4 cups, as I tend to offer it to whoever comes around, it always happens). Lavazza is a popular brand, maybe the best you can find in a average supermarket. It’s not bad but I would suggest to try Illy (www.illy.com); you’d be delighted. Hi Leo, many thanks indeed for the kind comment and for the information. Yes, I also carry my Moka pot with me all the time, you can see it here in my text about Vrsic Pass in Slovenian Alps. I just came from the Italian Alps, have been in Livigno and Bormio areas and bought two Lavazza packages. You can see here one text I added here from this tour. I find Illy expensive, with all good reasons of course. I tried it in the past and you are right, it is the best. The Illy factory is in Trieste, an important place for me. So you are an outdoor guy, why would you not submit some articles here? We all need first-hand information, this all site is about it. I always read what others have to say about mountains which I plan to climb. Please check this invitation for guest authors. Thank you Tomas. Bialetti is my favorite. Just going to make me a coffee using the same pot you have seen described in the text. I see you have a great site about coffee. It was great to know about Bialetti Espresso Maker . I had no idea about this espresso maker. Thanks for sharing. Hi Alisa, I see you have a site about coffee machines. Bialetti is not much of a machine, just a pot, but I love it. It is enormously popular in the south of Europe in particular. Thanks for visiting my site. If i want to share your content or want write an article about Bialetti with your reference would you mind? If you have know problem please send me an email. i will be waiting for your email. Dear Alisa, being a coffee addict I could not miss you site of course. My story with Bialetti started in very unusual circumstances as you have seen in the text. That was a true story. No problem for me, feel free to write as you wish. I shall send you my email. Thank you Alisa, it was a pleasure to read your text about such a nice tool like Bialetti Coffee pot. Much appreciated. Love the site! The article about the coffee makers was a really interesting read. Thank you Tony. Writing about Bialetti was my great pleasure; coffee addicted, plus such a nice tool, plus such a great true episode. All the best to you. Hey Jovo, I really enjoyed your review on this coffee maker. Not knowing anything about this item, I found it thorough, enjoyable and it really wants me to look into this device more. I’m a coffee fanatic and I love the simplicity and the ‘back to the roots’ vibe this thing has. Hi Jurgen, thank you, great to hear from you. It is pleasure to hear that you liked my story about Bialetti coffee pot. You have seen my own experience with it, the best present I have ever received. I hope your wife will understand your hints. All the best to you. Pretty informmative review. I find it very handy as I didn’t know how these pots function. As for the product it looks like one high quality coffee maker, and looks more practical than other expresso or capuccino makers. I’m not a coffee drinker, as everytime I drink coffee i get severe back pains. But still this product takes my attention. Hi JP, you really have strange symptoms caused by coffee. Of course it is reasonable to avoid it in such a situation. Bit in any case thank you visiting my site. Love the site! The article about the coffee makers was a really interesting read. I do love a cup of coffee, but I am not much into climbing or mountaineering right now, in fact it is something I am trying to get into. So if I so start up as a hobby I will be sure to get one of these nifty little things. I liked the pictures of all the different colours of pot, because honestly I didn’t really fall in love with the colour of the one in the first picture – but that is just me. Hi Jade, I myself have silver Bialetti, but can tell you I would love having the red. We all are different, so yes they have several great colors there. Thank you for the kind words. All the best to you. Hi, you are quite right about Italian households having many of these. We live in Tuscany and we have three, of different sizes. We are not typically Italian, as Italians really only have coffee in the morning and in the afternoon but our pots get well used throughout the day. The Moka is lovely gift, although we have given a few to British and American friends and they have looked at me as if to say ‘what must I do with this?, it is foreign to them. Hi, I did not know about such an attitude by Americans about Bialetti coffee pot. They have different habits in drinking coffee. I know that the pot is well-known even in Japan. I spent a year on Tenerife and see it sold in all shops, so they are massively used. Thank you, all the best. I must admit that I am not a massive drinker of coffee. Although I do love the stuff. This looks like an excellent little espresso maker. Nice and compact too,so it will not take up too much space in the kitchen! I would love to be able to buy one of these for my Mum for mother’s day. She’s is a big time coffee lover and this would be perfect for her! Hey Hannah, thanks for the comment. I myself received my Bialetti pot as a gift, so I am sure your mother will be delighted.